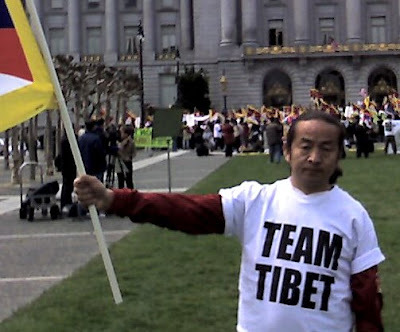 The Olympic Torch has landed, and the kind of circus that only San Francisco can stage will soon begin. The plan is to live blog a portion of the torch route tomorrow (Wednesday) on the String Bikini Theory supplemental team blog in coordination with the Cynic's Party. 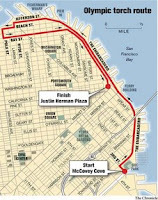 I'll catch the start at McCovey Cove, follow it to the Ferry building, and wait for it to come back (San Francisco residents are not permitted into the Fisherman's Wharf area that the Torch will traverse - that area is reserved for the exclusive use of tourists). Tom Usher of the Real Liberal Christian Church linked and commented on my recent Thomas Jefferson post, and I have no idea what the hell he is talking about. Our two year blogoversary is fast approaching, and we will be celebrating with the Carnival of Divided Government Duo et Vîcênsimus - Special Two Year Blogoversary Edition, on or about Wednesday, April 23. Submit your blog article at carnival of divided government using our carnival submission form. The words or idea of "Divided Government" must be in the post to be considered for inclusion. Its our birthday. Humor us. Past posts can be found on our blog carnival index page. Finally, I have been remiss in bringing to your attention recent carnivals and compilations of interest. Bill Spaced presents "Rant!" posted at Rants and Raves. The Maiden presents "This is not my country: The ’spring is in the air’ edition" posted at Hell's Handmaiden. The New Pundit presents the "Carnival of Political Punditry" posted at I'm a Pundit Too. The inaugural edition of the Carnival of Politics. Hazel presents "Carnival of the Libertarians-TLIH Style" at The Line Is Here. Alicia presents "Carnival of the Liberals #61 - Better Late Than Never!" at Last Left Turn Before Hooterville. Chameleon presents "Carnival of the Feminists #56" at Redemption Blues. I read the RLCC post and I have no idea what he's talking about either.